What happens when you take four guys and add them to an energy drink, a bottle of vodka and a squirrel divided by a magical hot tub? You mutate into a completely different person! Well, save for one of the guys who seems to have just gotten wet. 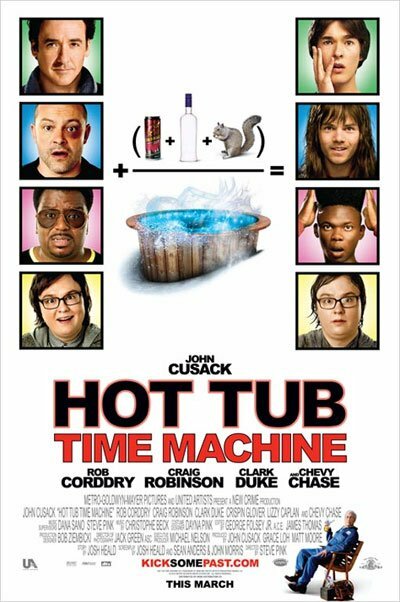 The poster for Hot Tub Time Machine (via EW) is certainly on the silly side, but so is the premise of the whole damn movie. In an attempt to spice up their lives, four friends take a trip to a ski resort. After a night of debauchery and hot tub partying, the gang wakes up – in 1986. The guys in corresponding photos look little to nothing like John Cusack, Rob Corddry or Craig Robinson, but who cares? Could this be The Hangover of 2010? My fingers are crossed.